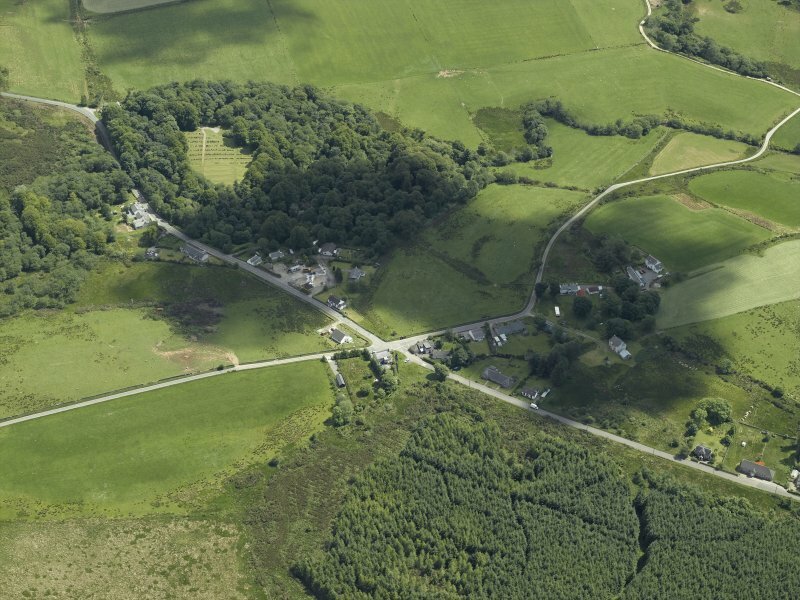 Oblique aerial view centred on the township and village, taken from the WNW. Oblique aerial view centred on the township and village, taken from the SW.
Oblique aerial view centred on the township and village, taken from the SE. Marked bricks found on the site include a fireclay 'Caledonia'; Allan & Mann, Govan Patent, Glasgow; Garnkirk; Star Works, J * D, Glenboig; Gartcosh; Walkinshaw, ; Patent, W Wilson, Glasgow. Fragments of others were found notably 'Kelvinside' and 'Reid & Lugton'. The Ordnance Survey Object Name Book describes the Powder Works as 'The Kames Powder Works is situated at Millhouse. It is of considerable extent. It is owned by a Company of which W McCallum of Kames Cottages is working partner. The works are surrounded on tracings (1st edition surey plan) by a yellow band (Name Book 1869). Additionally, the Name Book also describes an old magazine as 'This was originally the magazine to the Powder Works, but is now used as cottages', and the magazine as ' This is the store house for the Powder Works. A large new building surrounded by a high stone wall'. Kames Cottage is described as ' A mansion house belonging to Kames Powder Works Company, the portion of the works situated here is surrounded with a yellow band. The works at this place are chiefly stores for the material of which powder is composed with a good stone pier, the property of the Company' (Name Book 1872). The powder works are also depicted depicted on the 1st edition of the OS 6-inch and 25-inch maps (Argyllshire and Buteshire 1869, sheet cxciii) and annotated as 'Kames Powder Works'. Information from RCAHMS (DE), July 2007. 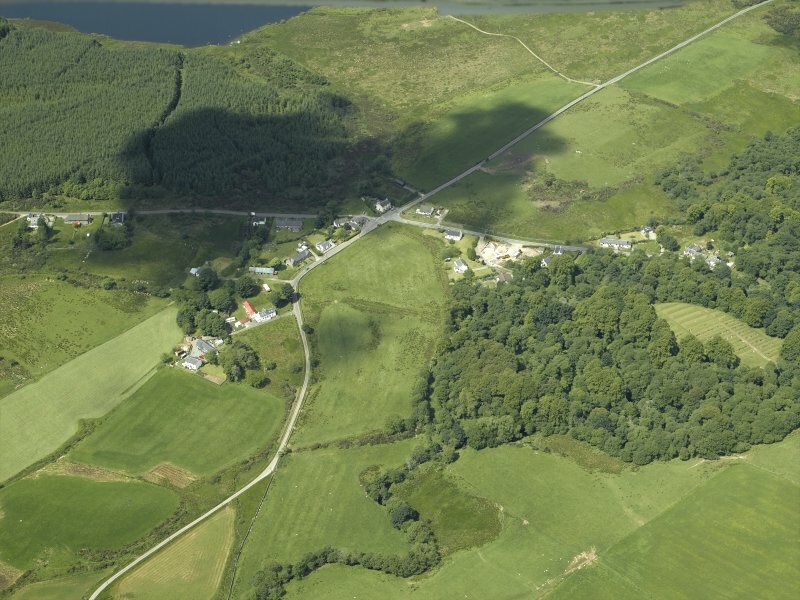 The remains of these gunpowder-works are situated at Millhouse, 1.7km WSW of Kames on the Kyles of Bute, where a saltpetre-refinery and pier were built by the proprietors. They were established by a Glasgow partnership in 1839 and acquired in 1876 by Curtis and Harvey, who transferred production from their works at Clachaig (NS18SW 5; RCAHMS 1992, No. 231). They remained in use until 1921, but many of the buildings have since disappeared and others are ruinous. Some can be identified, however, on a plan prepared in 1869 (New Statistical Account Vol.7 [Argyll], 1869). 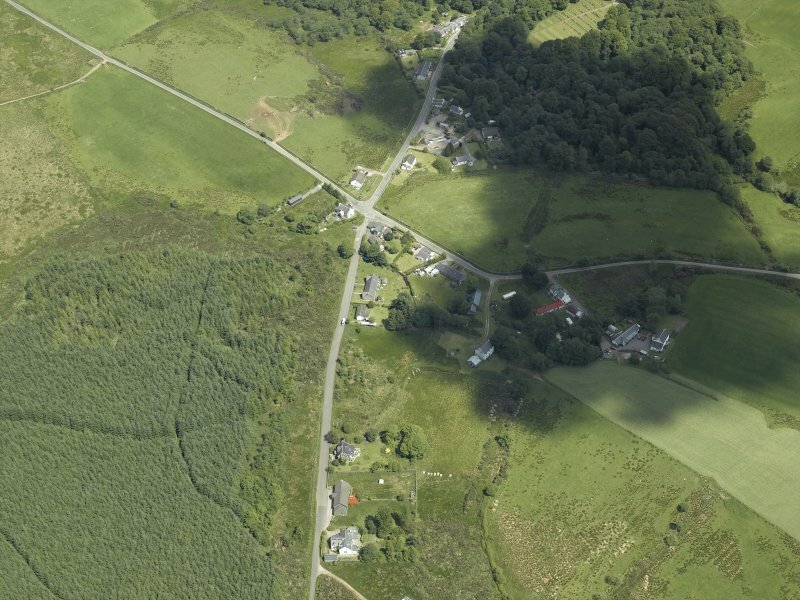 The site is traversed by the B8000 road from Millhouse to Kames, which divides it into the 'High Mills', extending N for about 600m along the W bank of the Craignafeoch Burn in a strip about 100m wide, and the 'Low Mills' to the S. These extended S through woodland for about 300m, surrounding an open area which is now occupied by a small cemetery. 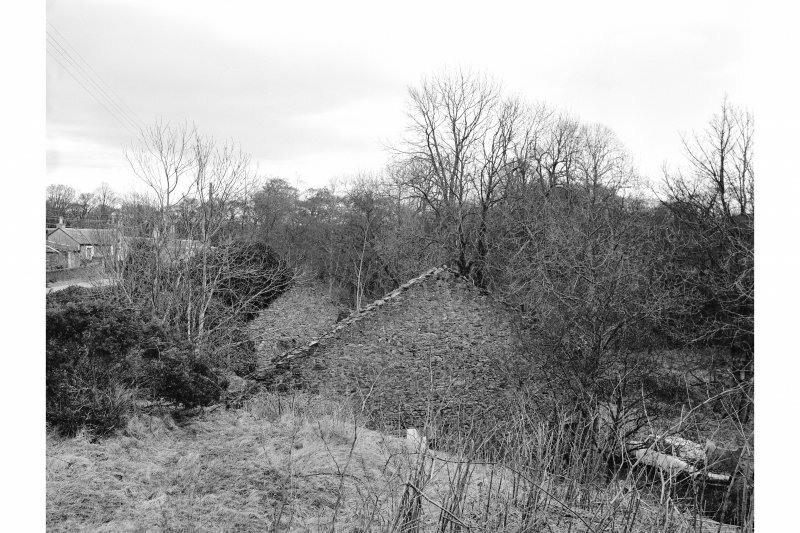 The water-supply to the High Mills was secured by a lade from the Craignafeoch Burn which was dammed about 3km to the N to form two artificial lochs, while that to the Low Mills was augmented by raising the level of Asgog Loch (RCAHMS 1992, see No.111). Steam power was also employed as early as 1855 (Trans Newcomen Soc, Vol.47, 1974-76). square, with large transverse timber beams which stabilised the pan-mills (Du Pont). The glazing-house was an open-fronted building set into a bank at the E boundary of the site, which preserves rubble footings for internal machinery and has a waterwheel-pit to the E, and a granulating-house of similar design was located at the S extremity of the works. A horsedrawn tramway, much of which can be traced, ran through the works, and stables were formerly situated in the raised central area of the Low Mills. The largest building in the works was the cooperage, situated at the S side of the public road beside the entrance to the Low Mills; it measured 18.8m by 12.8m and was gable ended. The road is lined with two brick-built and several rubble-built slated workers' cottages, most with porches, and that occupied by the manager formerly incorporated a clock in the gable of the porch. Adjoining it there is a bell carried on a cast-iron frame in the form of two dolphins. In the field W of the High Mills and 220m NNE of Millhouse crossroads there is a powder-tester (c. NR 9562 7077) used to record the quality of batches of powder. It is a small pear-shaped cannon made in a single iron casting with its flat base and designed to fire a 30kg cylindrical projectile, which remains rusted into the barrel, into a mound of sand 50m to the N. The expense-magazine, a rectangular rubble building 13m by 5m over 0.6m walls and protected by baffle-walls of earth, is set into the NE slope of the raised area in the Low Mills (NR 95966 70709), its exposed NE end facing away from the works. 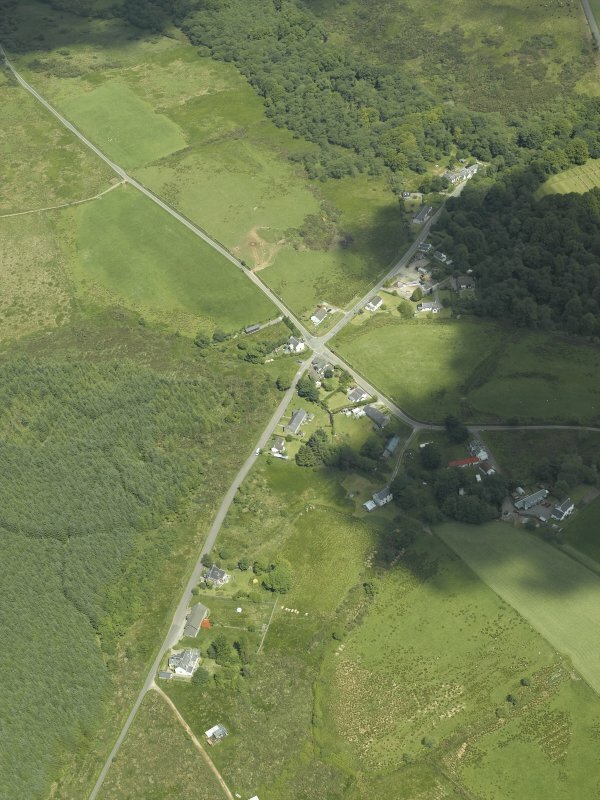 The main magazine was built shortly before 1869 in open ground 400m to the NE (NR 96290 70930), S of the present Kames - Millhouse road which was originally a private track used by the powder company. Much altered for agricultural use, it is a windowless rubble-built rectangle, 23m by 9.8m over 0.55m walls, with two lean-to chambers flanking the N doorway, within a 3m-high enclosure-wall. An earlier magazine on the shore 0.8km S of Kames (NR 97750 70583) had been converted to domestic use by 1869 (Name Book 1862). The former saltpetre-works at Kames (NR 97416 71413) are situated on the rocky foreshore 100m N of the public pier that was built shortly before 1855 and extended by a wooden jetty at that date (North British Daily Mail, 24 September 1855). They comprise a much-altered group of rubble buildings, few of which can be identified from the works plan of 1869. At that date they included charring houses for the manufacture of charcoal and stores for sulphur and soda as well as the saltpetre-refinery, and Kames Cottage (NR 97306 71469), a villa overlooking the works from the W, was the residence of one of the proprietors. At the N end of the site there was a private pier, the 'Black Quay' (NR79SE 65), which is built of vertically-set rubble slabs and extends NE for 38m.